At Izway, we don’t like making too much fuss over the little things we do that we consider part of our life and wine philosophy. Our livelihood is dictated by the climate and the condition of the air and soil, and it is obvious to us that we need to consider these factors when making bold decisions like building a winery. Establishing an off-grid winery was also important to us from a philosophical perspective; it seemed simple and achievable and is clearly the cleanest way to produce electricity. 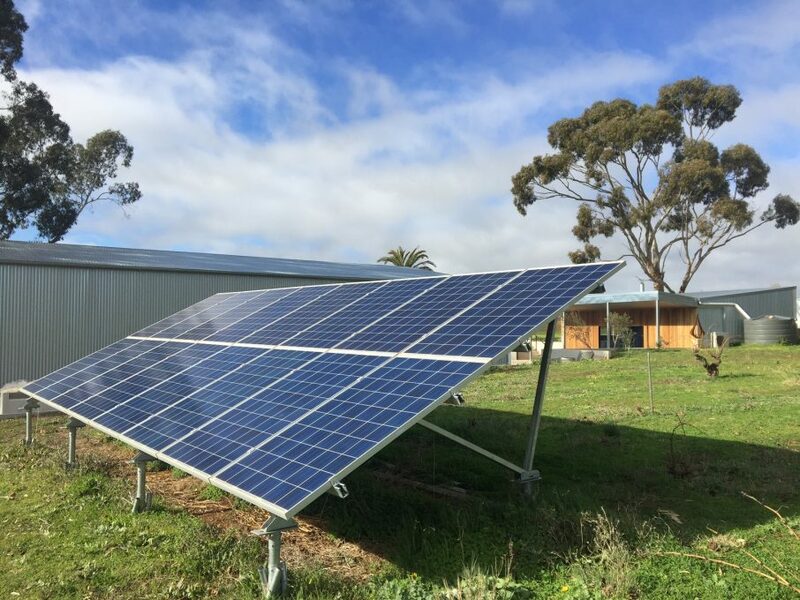 The cost of going off-grid was 50% less than connecting conventional power to our winery and cellar door site, so it was also an easy decision for us to make economically. With South Australia now experiencing the highest power prices in the world the leap of faith has certainly paid off. There has been a lot of press surrounding SA’s power problems and we applaud Elon Musk’s bold commitment to resolving the state’s electricity problems with a Tesla battery farm. After two seasons and 18 months in cellar door we are now able to declare that our off-grid little battery powered solar system is a success! The power we generate runs our winery, office and cellar door. We rarely dip below 90% full batteries and when the rest of SA is in blackout we can still operate successfully. Living on site means that we can even run power to the house to operate the fridge, tv, lights and hot water which is pretty handy when you have a young family. We are currently investigating options to have the house set up on the same solar power system so we can be completely free! The feeling of independence is liberating and one of my favourite times to work is at night with all the lights on, knowing that we have generated the power ourselves completely off-grid. We went to great lengths to ensure that the equipment we bought was efficient and that all buildings were heavily insulated and extremely well built. The final piece of infrastructure we will add is an underground barrel store. We will use no power to control the temperature and the humidity should be ideal for storing and maturing wine. We need to sell some more wine to finish this project, but it will happen. So if you, like us, care about our planet and its future then come and taste some wine in our off-grid cellar door. And buy plenty as well; just to help the environment. we recently visited your winery and were fortunate enough to be walked through a Sunday morning tasting by Liam. What a delightful and knowledgeable young man. We live on the South Coast of NSW and now have some of your wines in our cellar. i look forward to learning more about your upcoming vintage and will be happy to support your environment friendly vineyard.